Serenity Health & Home Décor provides you with thousands of stress-free and relaxation and home decor products. We want you to find products that truly calm, relax and bring serenity into your life and beautify your home both indoors and out. Our headquarters are located among the beautiful lakes, rivers and trees of Northern Wisconsin. You can initiate a return for new and unopened items within 15 days of delivery for a refund. To qualify for a refund, items must be in new and unused condition with all original materials and/or accessories. If a return is not received at our processing facility within 30 days, it may be subject to a partial refund. You will be responsible for return shipping costs. However, if the return is a result of a fulfillment error, product defect, or damage incurred during shipping, we will refund the full cost of the merchandise. We will provide a pre-paid return shipping label for Non-Buyer's Remorse returns. All returns are subject to inspection, and if found not to be an error on our part, the return shipping costs will be withheld from your refund. SPECIAL RETURNS INSTRUCTIONS: Once the seller approves the returns request, they will provide a Returns Merchandise Authorization. This zippered canopy sidewall will provide protection from the rain and sun and allow an easy and customizable entry-way for an outdoor canopy gazebo. It's easy to install with hook and loop fastener straps and easy to open with heavy-duty zippers. Whether the activity of the day is a sporting event, picnic, day at the beach, camping, or anything outdoors, this sidewall will protect all from light rain and sunlight. 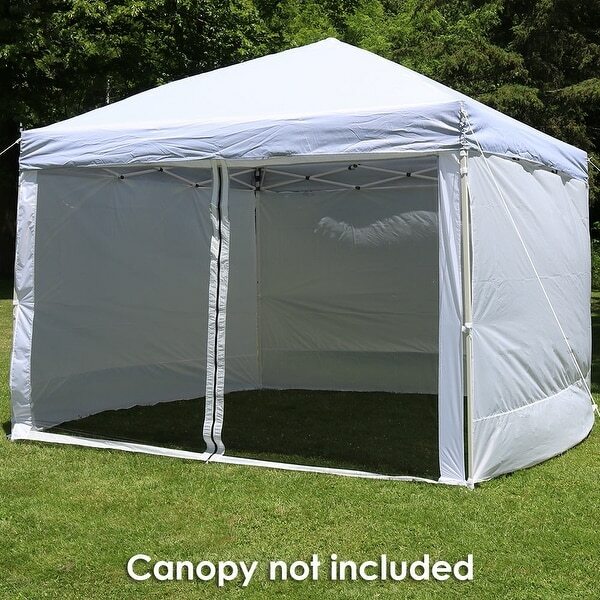 This specific kit comes with 1 zippered sidewall and 3 standard sidewalls to create a gazebo effect.